Basle-based Israeli vocal ensemble Profeti della Quinta were worthy winners of the York Early Music International Young Artists Competition in 2011, and this disc is their prize. 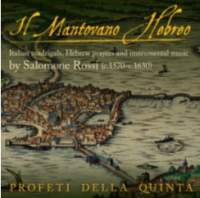 It is not a debut and nor is it the first time they have recorded music by the Jewish composer Salomone Rossi (c1570-c1630), but it is a fine way to announce their arrival. For whereas their 2009 Pan Classics release focused on Rossi’s unusual polyphonic settings of Hebrew psalms and prayers, here they range across the entire compass of this agreeable composer’s output, taking in madrigals, vocal duets, and (courtesy of some guest instrumentalists) sinfonias and dances for two violins and continuo. It is of course fascinating to hear polyphonic psalms sung in Hebrew by native speakers but it is important to point out that the music has no more of a Jewish flavour than that. Rossi was a contemporary of Monteverdi in Mantua and as a composer was in the mainstream of Italian music of the period. His vocal music is mostly late-Renaissance in style, being fivepart settings of texts by poets also treated by Monteverdi and Marenzio. Rossi’s versions are elegant, skilled and attractive but do not have his colleagues’ level of dramatic incident. More sparkily Baroque are the duets from his Madrigaletti and the instrumental pieces, which are among the earliest applications of the trio sonata principle. Profeti is an all-male group and, as often with such ensembles, distinguished largely by the sound of its top-line altos. Both here are light, fluid and focused, and, though not always quite in tune, have character enough to carry off sweetly a couple of the madrigals as solos with lute (Rossi’s own suggestion). More importantly, though, the group as a whole perform with a secure sense of direction and a feel for the music, and are confident enough to add occasional discreet ornamentation. The instrumental playing is also excellent. Definitely an ensemble to look out for.